Nan and I were out in Solomons, Maryland for a long weekend last week to check the progress with the refit project on Whispering Jesse. Though we have owned the boat for over a year, it was the first time that Nan had ever seen it, and I was nervous about what she would think. Fortunately, the boatyard's mechanic, Chaz, had heard that it would be my wife's first look, and he took the time to clean up some of the mess that I saw when I was last out there over Memorial Day weekend. It paid off. Nan was favorably impressed when we entered the paint shed on Friday morning. 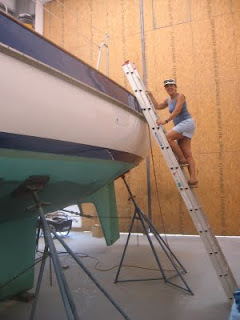 She carefully climbed up the ladder and then down into the cabin to check on accommodations. When I asked what she thought, she said the boat definitely had potential. I took that as a good sign and showed her the berths, the head, the galley, the nav station and everything else, including the newly repainted engine room and the new stainless steel portlights. We couldn't spend too much time down below because it was like a sauna down there. In fact, the weather all weekend was like a sauna. I've never experienced that level of heat and humidity before. We had purchased a Zodiac inflatable dinghy at Washington Marina in D.C. the evening before, and Kevin from the boatyard helped me move it out of the rental car and into the shed. Then Nan helped me haul all the sails off the boat and we were off to see Clarke at Quantum Sails to see if they could be cleaned and mended as necessary. I haven't heard back yet, but I'm hoping for good news because new sails are not in the budget. Since we were in the neighborhood, we stopped by Creative Canvas Design to see if we could talk with Steve, the owner, about the dodger and bimini he is making for the boat and to show Nan the interior cushions he has already made. He wasn't there, and his seamstress didn't want us going upstairs to see the cushions, so we wrote Steve a quick message and left. 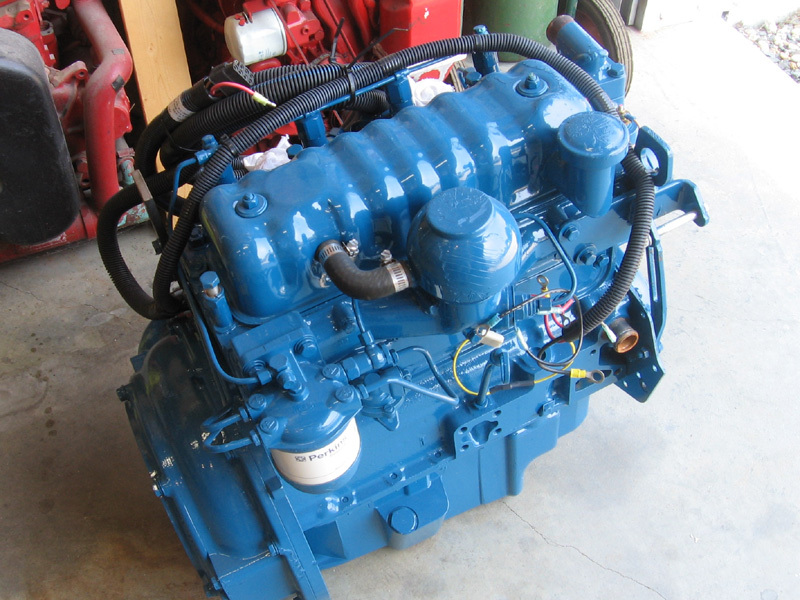 Back at the boatyard, we took a look at the new engine, a remanufactured 50-horsepower Perkins 4-108, which was sitting in the garage next to the paint shed. Chaz walked in and introduced himself to us. 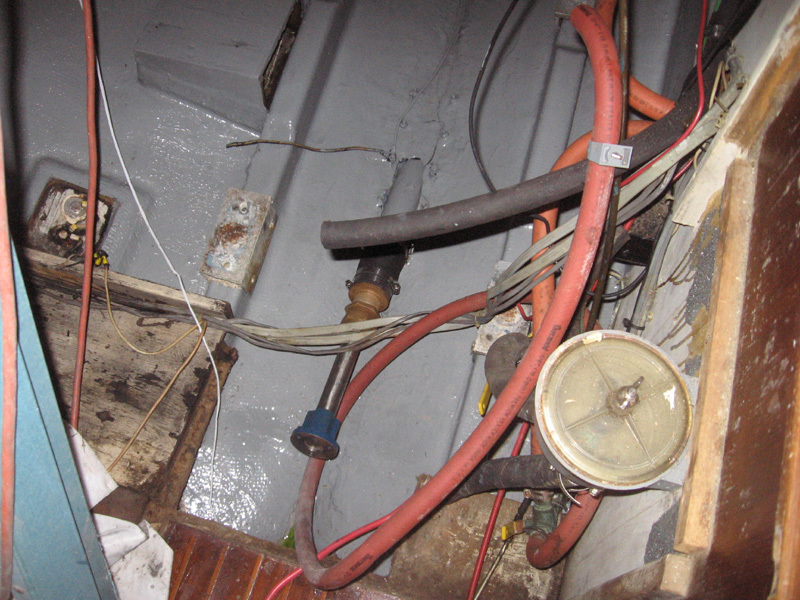 I commented about the improved condition of the boat and he said that he had cleaned it up. When I thanked him, he smiled and said, "Hey, I have a wife, too!" He walked with us into the paint shed to show us a problem with the JRC radar antenna, which is called a radome. 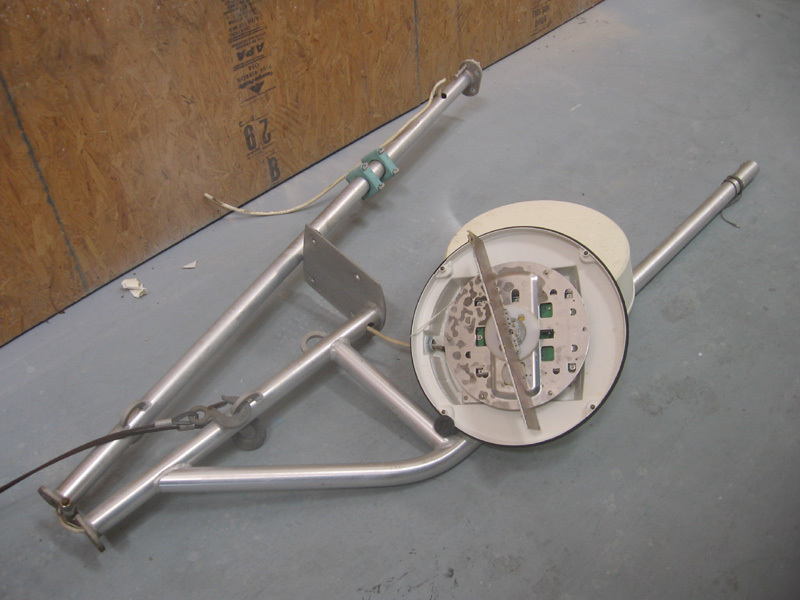 At some point, the antenna's pole had been left in its hinged position and rain had collected inside, corroding the sensors. Chaz said it was ruined and that I should see if I could find a replacement on the Internet. He also showed us how he had cleaned up the folding two-blade propeller. He said he didn't recommend replacing it with a new Max Prop because the shaft had been tapered to fit the existing propeller and would need to be replaced for a new one. Nan and I next went over to the local West Marine to check out boat accessories. I looked at expensive fenders while Nan looked at discounted sandals. For the heck of it, I wandered over to the electronics area and struck up a conversation with sales associate Bob S. about radar, chart plotters, AIS and radomes. He told me that all that equipment is matched by the manufacturers and that it would not be possible for me to replace the JRC radome with a new Garmin one, for instance, if I couldn't find a replacement online. When I asked how much a complete rig would be, he estimated it at about $6000, plus installation. So that isn't going to happen anytime soon. Back at the boatyard once more, Nan and I met with Don, the boatyard manager, to discuss the timeline for finishing up the refit and what remained to be done. 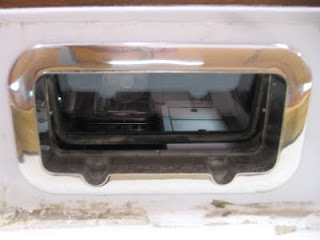 In addition to the current projects, we agreed that the bottom needs to be repainted, the manual toilet needs to be rebuilt, the stove problem needs to be fixed and the electrical system needs a good going-over. Don didn't think any of this would delay getting the boat into the water, getting the mast stepped and getting all the new standing and running rigging in place before I return on September 3. That's when my friend Mike Young and I will be arriving to get the boat into final shape for a September 8 departure for Savannah, Georgia. Another friend, Kurt Beereboom, will be flying in on September 7 to join us. There will be much more about our plans for this sailing adventure in future posts. During our forays around the boatyard, Nan and I ran into John Simonton, who has been living on his boat at the marina, and chatted with him briefly in the cool of the marina's upstairs lounge. He mentioned that he was thinking of sailing south to Charleston for the winter, and I told him my crew and I would be sailing that way in early September. He said he would give it some thought and let me know if he would consider forming a two-boat flotilla for the trip. Before we headed out to Solomons, I ordered sets of vinyl letters from BoatU.S. that spell out "Whispering Jesse" and "Savannah, Georgia", our boat's name and hailing port. I had intended to apply them myself while we were out there, but Don talked me out of it. He said they had a person on staff, Marty, who used to own a sign company and could probably do a much better job of it--aligned straight and without any bubbles--so I entrusted the letters to Marty's capable hands. We'll need to plan some kind of a christening party at some point before we sail away in September. It may be just the way that everything seemed larger when I was younger, but I remember that it used to snow a lot more than it does now. Where we lived, a few miles west of Lake Michigan, it would start to snow right after Thanksgiving, and there would be snow on the ground until St. Patrick’s Day. During the holidays, there would be two feet or more in the front yard. As with the size of things, time seemed more drawn out then. Christmas breaks seemed almost endless, especially as I approached my teen years. With the excitement of Christmas Day behind us and the New Year looming, we would counter the boredom of being cooped up inside by going out to play in the snow. The proximity of Lake Michigan kept the climate humid and contributed to what we called the “packing” quality of the snow. It was excellent for making snowballs, and we obliged it by making and throwing snowballs all winter long. We would throw snowballs at each other, at street signs, and at passing cars and buses. We would make a game out of seeing how many times we could hit a bus as it passed, with extra points awarded for getting a snowball through an open window. On one of those Christmas break days, in 1970, I was wandering around the neighborhood with my friend John from across the street. It had snowed heavily the night before and there were at least three feet of heavy, wet snow on the ground. I knew it was wet and heavy because I had already shoveled it off our driveway and sidewalks. Up the street, John and I noticed that our friend Dave, who lived next to John, and another neighborhood kid, Robbie, were dragging Christmas trees toward us. This was back when everybody had live trees, which would dry out and become fire hazards if they were not taken down right after Christmas. It was the city’s practice to collect the trees from people’s curbs and mulch them into fertilizer, which they would then sell back to the people. It helped to ease the guilt over wasting all those evergreen trees. Dave and Robbie had decided they would have some fun with the Christmas trees before they were collected. They were dragging every tree in the neighborhood into Dave’s front yard. When we asked them why, Robbie said they were going to use them to build a fort, like a giant teepee made of trees. John and I thought this was the most ridiculous thing we had ever heard and said so. Robbie’s pale face turned crimson but I couldn’t tell if it was from embarrassment or anger. John was something of a bully in those days and he saw an opening. He walked over to the few trees that were leaning together and shoved them over. Now there was no question that Robbie was angry. He sputtered that we should leave him alone and seemed to be on the verge of crying. Dave looked like he was trying to work up the nerve to order us out of his yard. John kicked at the trees and teased Robbie: “What are you going to do about it, you cry baby?” This infuriated Robbie, and he started moving toward John through the deep snow, like he was going to try to hit him or wrestle him to the ground. John laughed mockingly as he dodged out of Robbie’s grasp. I had been packing a snowball during this entire exchange and it was now as hard as a rock. When Robbie made another lunge for John, I threw it with all my might. The snowball hit Robbie squarely in the back of the head with a sickening crack. He went facedown into the snow like he had been shot. He didn’t move for several seconds, and I worried that he was badly injured or possibly dead. But then he emitted a horrible wailing sound and struggled to his hands and knees. I was so relieved to see that I hadn’t killed him that I started laughing uncontrollably. Robbie got to his feet and turned to face me. He was covered in snow. It was melting off his bright red face and mixing with tears as he cried hysterically. I tried to sympathize with how much his head must have been hurting, but it didn’t stop my idiot laughing. Robbie lumbered toward me, and I was sure he intended to kill me. I backed away through the deep snow and then turned to run across the street to the safety of home. But Robbie was a big kid, and he had rage working for him. He caught me in my front yard and tackled me into the snow. Before I could struggle away, he sat on my back and shoved my face violently into the snow. I couldn’t breathe. I tried to get away but I couldn’t move. My vision was fading and I could feel myself losing consciousness. Adrenaline took over and my body did a super push-up, throwing Robbie off my back and bringing me back to my feet. Robbie looked astonished as I turned to face him, my arm fully cocked. He never saw the roundhouse punch that hit him squarely in the temple. Again, he went down like he had been shot, this time on his back. I stood over him, my hand on fire, not believing what had just happened. Robbie lay on his back, blubbering and in obvious pain, his arms and legs spread like he was making snow angels. I was overwhelmed by a terrible sense of shame at what I had done and turned to walk away. I went quietly into my house and downstairs to the basement rec room. I sat in the dark replaying the fight in my mind and trying to wish it away. The phone rang and I could feel the blood drain out of my body. I heard footsteps approaching upstairs. My mother stopped at the top of the stairs and said, “Are you down there? Robbie’s mother is on the phone, and she is very unhappy. What did you do?” I didn’t answer her right away. How could I explain that in the short time I had been outside playing in the snow, I had almost killed a person and then almost been killed by that same person? I opened my mouth to say something but heard her steps retreating back to the phone. I sat in the dark and watched the light fade from the day. On Sunday, in keeping with the spirit of Independence Day, I hiked the Liberty Cap trail with Rich, Wes and Rita, who were also on Saturday's rafting trip. 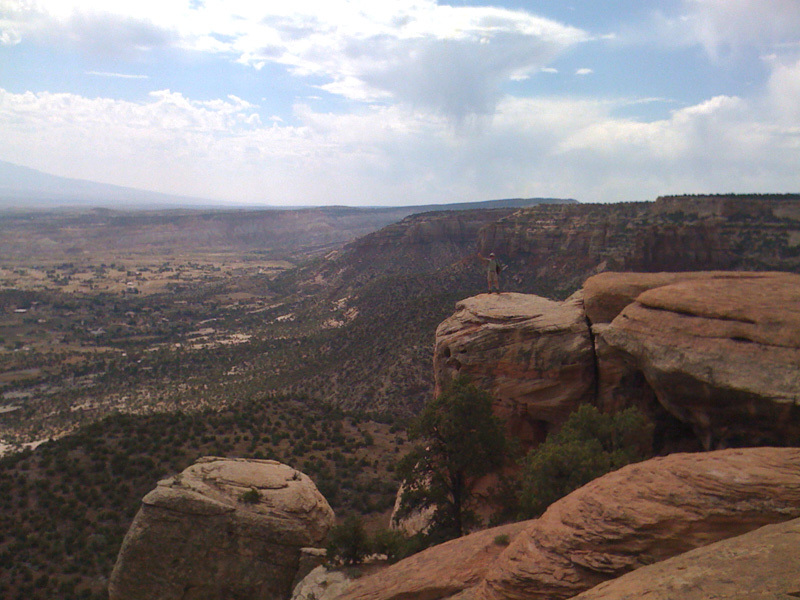 It was only my third time on the trail, mostly because it is inside the boundary of the Colorado National Monument and dogs are not allowed. If I'm going to go for a hike, I want to take my dog Scout with me, so I normally hike outside the Monument. 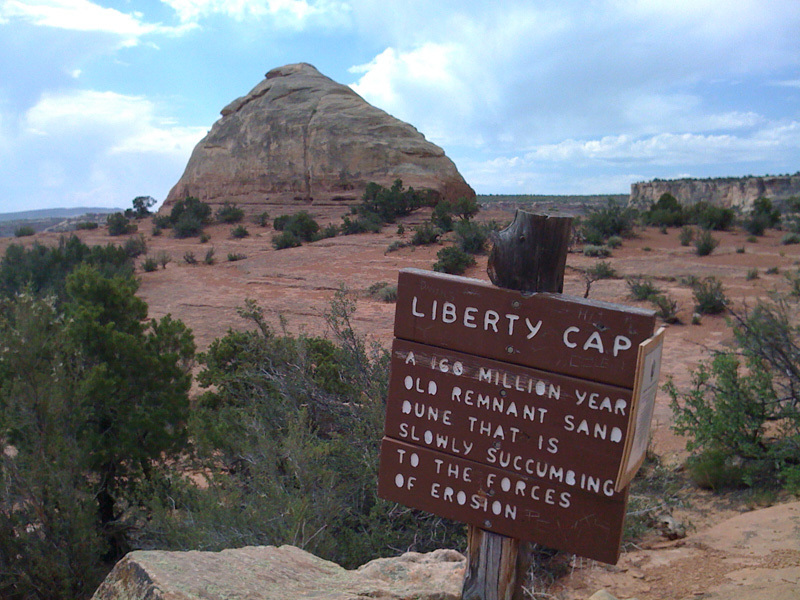 One of the reasons I wanted to do the hike, even though it meant leaving Scout with Nan at home, is because I see the Liberty Cap every morning from my bedroom window and because it involves some unusual terrain. Near the top, there is a series of switchbacks up narrow sandstone ledges, which has caused me to refer to the trail as "the miniature golf course of hiking trails." It's like taking a regular hiking trail and compressing it down to its most basic elements. The four of us got off to a fairly early start, leaving the trailhead off Wildwood Drive before 9:30. The temperature was already in the mid-80s, so I was glad I had my CamelBak full of ice and water and not just a water bottle. The distance to the top is two miles and we made it up there in about 40 minutes, stopping along the way to drink water, take photos and admire the view. 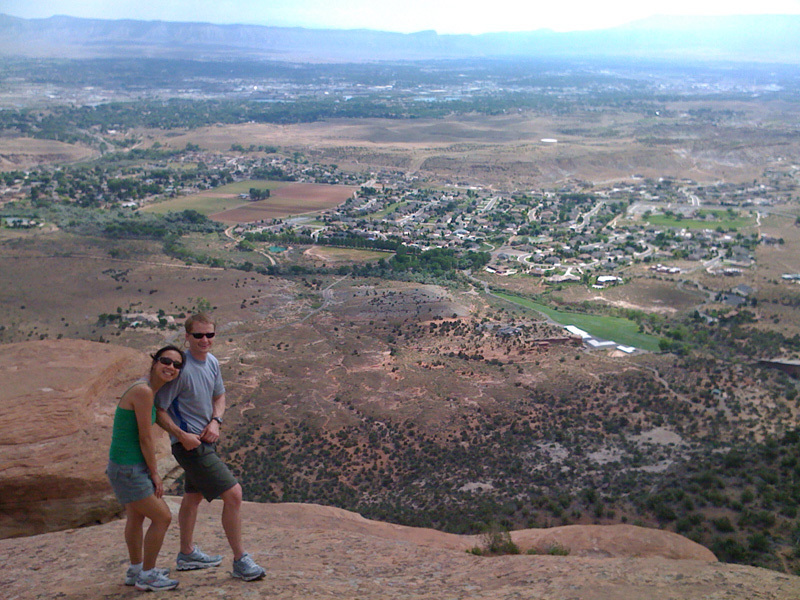 When we reached the top of the trail and were standing next to the Liberty Cap, which is a giant, impressive-looking petrified sand dune, I mentioned that some people take the hike to its natural conclusion and climb up the Cap itself. Wes and Rich immediately started trying to figure out how that could be done. The Cap is shaped like a breast, or like a rounded, lopsided cone, and the trail ends at the steeper side of it, which would be a dangerous free climb. So we all worked our way around to the less steep side to see if there was an easier way up. While Rita watched, Rich and Wes tested some foot and handholds, and I went back around to read the Liberty Cap's sign, which for some reason is a good 75 yards from the Cap. Screwed to the main sign was a smaller one that warned people not to attempt the Ladder Route up the Cap due to damage to the rock and rungs. This was news to me, that there was a named route up the Cap and that it had permanent rungs. As I started to walk back to meet the others, Wes called my name and I looked up to see him standing on top of the Cap. He had discovered the Ladder Route on his own and risked the climb. When I caught up with Rita and Rich, they were on the back side of the Cap, on the other side of a big crack I had never jumped over before, and they were watching Wes carefully pick his way back down. I could see why the route was supposed to be closed, because there was only one rung left, it was more like a bent rod, and it was at least ten feet up. Wes had shoved his fingers into the holes in the sandstone left by the missing rungs and kicked his way up. 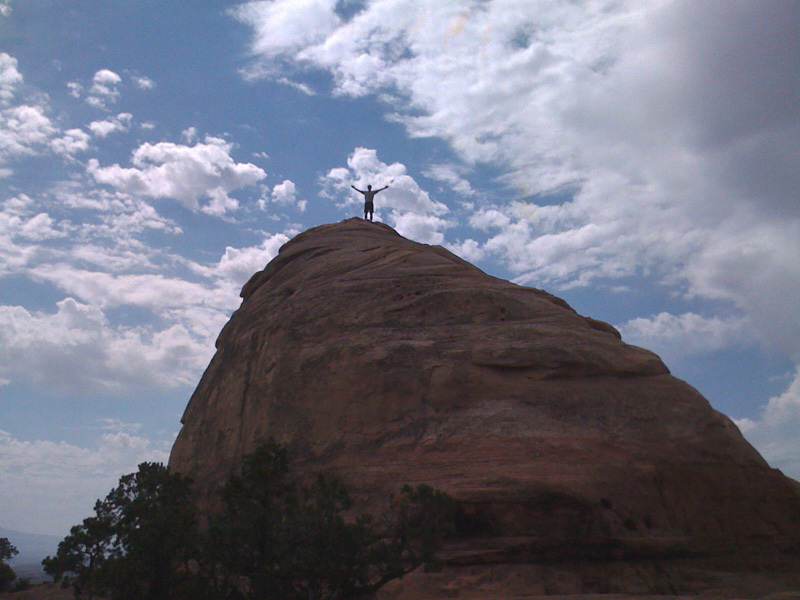 Now he was using Rich's shoulders for footholds as he climbed back down. We took more photos, admired the views one last time and then made a hasty retreat as the biting gnats were making it uncomfortable to stand still and there was no wind to keep them away. 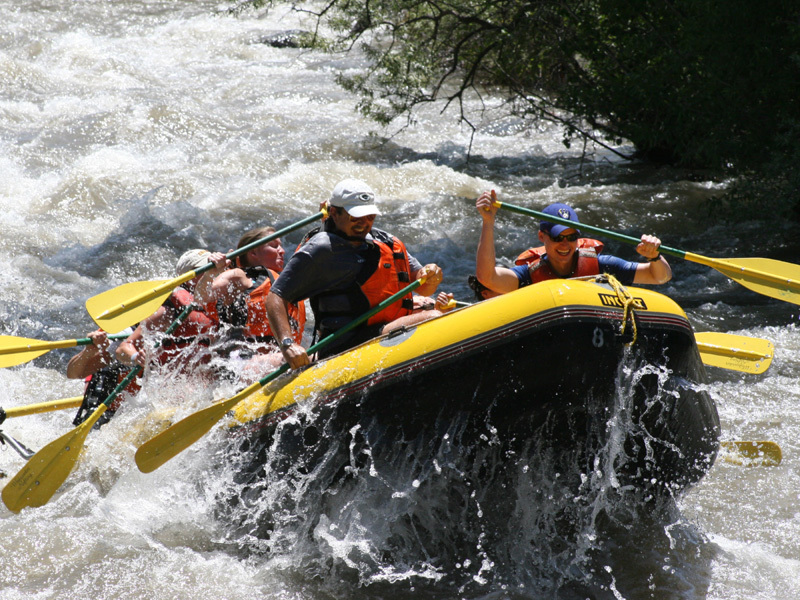 I had so much fun whitewater rafting a couple of years ago with my friend Kurt Beereboom (Rafting the Colorado River) that when our friends and neighbors Rich and Diane Heintz proposed taking a rafting trip down Glenwood Canyon, I definitely wanted to be included. My enthusiasm must have been infectious because I managed to talk Nan into it, too. By this past Saturday morning, we were a group of eight: the Heintzes, Diane's daughter Bree and son Wes, Wes's girlfriend Rita, our friend and neighbor Mim, and Nan and me. 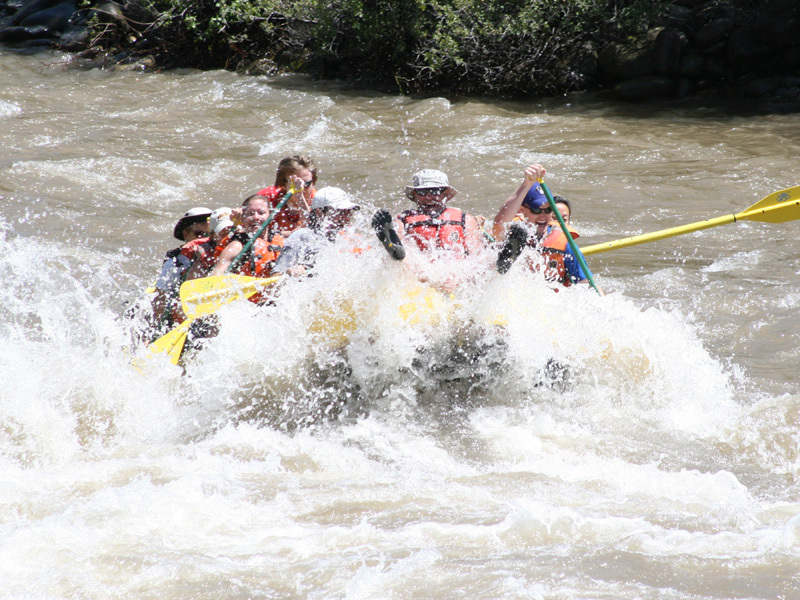 We all met up at the Whitewater Rafting facility in Glenwood Springs and after a brief orientation, piled into a school bus with about 30 other rafters for a ride up to Carbondale. Apparently, the Colorado River is running dangerously high right now through Glenwood Canyon, with all the runoff from last season's record snowfall, so we would be doing a "three-fer" instead: the Crystal, Roaring Fork and Colorado rivers, for a total of about 18 miles. I didn't know what to expect when we shoved off from the banks of the Crystal, but the water around my ankles sure was cold. Our guide Matt had us dig our canoe paddles in with gusto as we surged below the County Road 108 bridge and into the first set of rapids. Holy crap, I thought, as the raft disappeared into a big hole in the water and launched out the other end, thoroughly soaking Wes and me at the bow. After the shock of the cold water, all I could think was, Woohoo! We surged through subsequent holes at weird angles that had everybody else soaked and laughing. The Crystal soon fed into the Roaring Fork, which was living up to its name and really moving. Matt had us dip our hands into the water to see that it was slightly warmer than before. Ever so slightly. We cruised through riffles, watching the bald eagles and herons that nest along the river and admiring the beautiful houses along the river that we could never see from the roads above. We noticed a girl in one of the other rafts sitting on the bow and asked Matt what she was up to. He said she was "riding the bull" and he asked for volunteers from our group. Rich climbed up front and had the ride of a lifetime through the next set of rapids. Then it was Wes's turn and finally Rita's. After that, the river settled down again, and we started to wonder if that was it for the excitement. It was not. The river saved the best for last, and we were all thoroughly soaked again. A little ways on, the Roaring Fork joined up with the Colorado River, which felt immense and heavy. The water was slightly greener and ever so slightly warmer, and it smelled lightly of dead fish. A few hundred yards later, we were at Whitewater Rafting world headquarters again. We pulled the raft out, handed in our paddles and wandered up the bank to the parking lot to retrieve towels and dry clothes from our cars. After changing, we met up in the photo room to see the photos Matt had told us would be waiting. Nobody remembered seeing any photographers on any of the banks or bridges, but whoever it was sure took some great shots. Mim purchased the photo CD, which is where the images in this blog post are from, and we headed out for an early dinner and some well-deserved beers at the Glenwood Brew Pub. 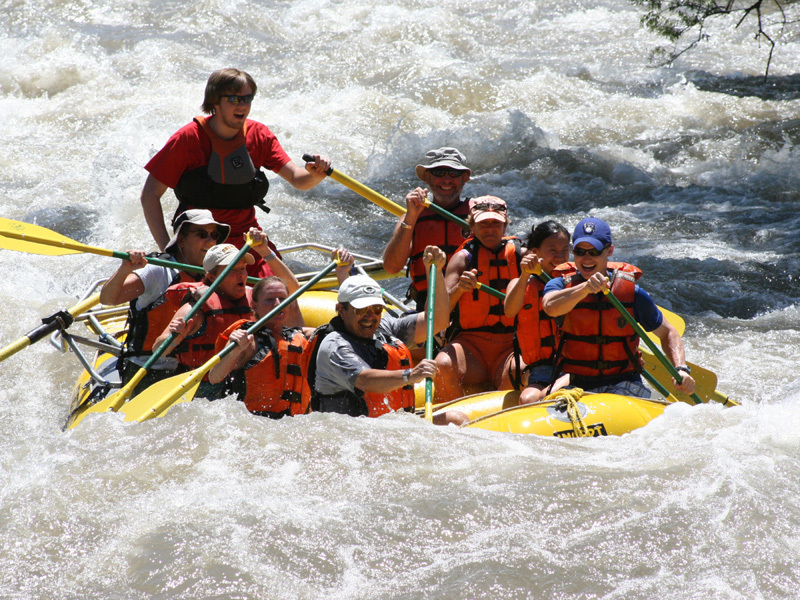 If you've never tried whitewater rafting, you don't know what you're missing. I used to think it was no big deal, but now I'm a convert. It's a blast!